CAPE CANAVERAL, Fla. ? 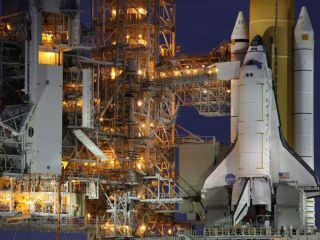 NASA engineers are studying anapparent engine controller glitch in a backup system on the space shuttleDiscovery, in the hopes of solving the issue in time for the shuttle's scheduled launch tomorrow. The glitch is affecting the backup computer controller on Discovery'sMain Engine No. 3, but further details have not yet been released. During the shuttle's main engine checkouts, the backup controller for engine 3 did not turn on as expected, NASA officials said in a statement. Engineering teams are continuing to investigate the issue. "After addressing a couple issues last night, ourcountdown work is currently back on schedule," NASA test director StevePayne told reporters during a mission status briefing this morning. Discoveryis slated to blast off tomorrow (Nov. 3) at 3:52 p.m. EDT (1952 GMT) from a seasidepad here at NASA's Kennedy Space Center. The mission has been delayed by twodays by other technical issues that have since been solved. The shuttle's STS-133 mission management team is scheduledto meet at 5 p.m. (2100 GMT) to discuss the issue and make a decision onfurther action. If the issue is resolved, NASA would then proceed with plansto begin fueling Discovery's external tank early tomorrow morning for itsafternoon launch into space. Spaceshuttle Discovery will begin its 39th and final mission to theInternational Space Station when it blasts off this week. Weather forecasts continueto show a 70 percent chance of acceptable conditions for launch tomorrow. Discovery was originally scheduled to launch Nov. 1. The space agency delayed the launch by one day after detecting helium and nitrogen leaks on the shuttle. Another day of delay, to allow time to complete repairs, pushedthe launch to Nov. 3. While the weather outlook forWednesday looks promising, NASA is tracking some other storms that could stallDiscovery's flight if it suffers another launch delay. A weather front pushing down intoparts of central Florida could cause concerns if Discovery's launch is stalledanother 24 hours or more, according to Kathy Winters, NASA's shuttle weatherofficer. NASA has until Sunday, Nov. 7 to launch Discovery within thecurrent window. After that, the space agency would have to wait until earlyDecember to try again.